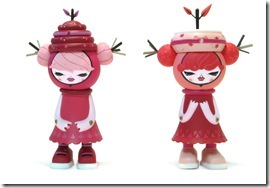 We're back... Last time we left you with a look at turnarounds of Bumble and Tweet, Julie West’s first vinyl figures due in the Fall from STRANGEco. Today we’re bringing you the very first public shots of the vinyl color tests of both figures. As you can see in both colorways (pinks and gray/green), the finely detailed deco has translated well. The bees and birds are mostly absent in these shots as they do not yet have magnets installed for proper positioning. Very impressive especially considering these are not final and need a few minor tweaks. Rather than having you deal with us rambling on, we’ve asked Julie and Emily Brough of STRANGEco for their impressions of these first color tests. First up, Julie talks us through her initial reaction. Seeing the color samples really brought the whole project together for me. I know that they aren't perfect (though they look pretty darn close to me!) and that we are missing the birds and bees at this point but everything looks pretty spot on. I think that this stage in the process has really made them seem "real" to me, more so that seeing the other steps - perhaps only because they are closer to looking complete. We close with Emily Brough’s comments on her view from managing the production. She touches on the mix of rotocast vinyl and injection molded pieces used for these figures – a necessary step to achieving certain detailed looks. Additionally, minor alignment issues of "pads" seem to be the norm in product revisions. We were pretty blown away by the accuracy of these first color samples. We had previously discussed removing some of the smaller elements (specifically the dots around the face) but they ended up pulling it off so well! The only real comments we had was adjusting the fit of the paint mask on the face (some fall a little short), but other than that... these are almost exactly spot on. We've actually had the roto parts all colored and completed for 3 weeks so getting the Injection molded elements in (ed: face, birds, bees, branches, and hair sticks ) and putting the whole thing together was such a treat! For me personally, this is one of my most favorite pieces we've made recently. I think it's just beautiful and reflects Julie's work so nicely.... we're so excited to show them on Friday night @ Julie's show at Myplasticheart! 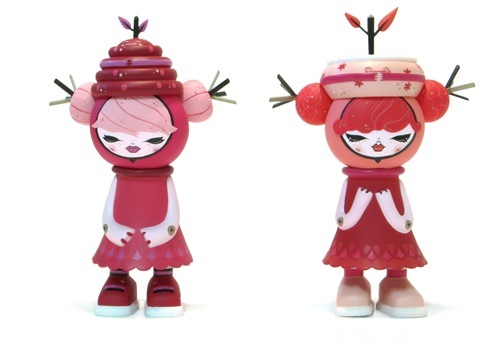 If you’re in NYC or near by, drop by the opening of Julie’s Sickly Sweet solo this Friday (8.8.08) @ myplasticheartnyc for her original art and a first-hand look at the Bumble and Tweet color protos. Stay tuned to Vinyl Pulse for a look at the Bumble and Tweet packaging in a few weeks.